������ Virtually enveloped by mountains and valleys, Phayao is a peaceful province. Though with only modest facilities and conveniences, it is an enchanting community with delightful natural beauty and fascinating religious sites. Dating back to more than 900 years, it used to be an independent state with its own rulers before it became a part of the Lanna Thai kingdom in mid-14th century. Phayao is about 691 kilometres from Bangkok and covers an area of 6,335 square kilometres. Administrative, it is divided into the following districts: Muang, Chun, Chiang Kham, Chiang Muan, Dok Khamtai, Pong, Mae Chai, Phu Sang, and Phu Kam Yao. From Bangkok, take Highway No. 32 and Highway No. 1 to Phayao via Ayutthaya, Ang Thong, Nakhon Sawan, Tak and Lampang, a total distance of 966 kilometres. For an alternative route, take Highway No. 1 to Amphoe Tak Fa via Saraburi, Lop Buri before turning into Highway No. 11 to Phrae via Phichit, Phitsanulok, Uttaradit, and then proceed to Phayao along Highways No. 101, No. 103 and No. 1. Bus companies which operate daily bus services from Bangkok's Mochit 2 Bus Terminal to Phayao are such as Transport Co. Ltd Tel: 0 2936 2852-66, website: www.transport.co.th; Siam First Tour, Tel: 0 2954 3601, Sombat Tour, Tel: 0 2936 2495. Visitors can take a regular train from Bangkok to Lampang or Chiang Mai, then connect a bus to Phayao. Call 1690 for more information. Visitors can fly from Bangkok to Chiang Rai and then connect a bus to Phayao. Contact Thai Airways at Tel: 1566 for more information. Apart from the perfect natural condition, the national park is also a habitat of Pu Lu or Siamese big-headed turtles, a rare and endangered species of turtle. This kind of turtle is small, short, has a long tail and big head. As their head is large, their 4-legs and tail cannot be drawn back into their shell. Phu Sang National Park is a part of Doi Pha Mon Mountain Range in King Amphoe Phu Sang, Chiang Kham District, Phayao, and Theong District, Chiang Rai, with a 30-kilometre boundary, connecting to the Lao People’s Democratic Republic, covering a total area of 178,049 rai. Within the area are hill evergreen forest, dry evergreen forest and mixed deciduous forest. The precious plants include Yang – Dipterocarpus alatus, Takhian - Hopea odorata, Champi Pha – Michelia floribunda, cigar-box cedar, Burma Padauk, teak, Rang - Shorea siamensis, etc. This area comprises high and undulating mountain ranges where the summit of Doi Pha Mon, an original source of the Lao, Pueai, Bong, and Yuan Rivers, nurturing the agricultural sites of Chiang Kham District, Phu Sang Minor District in Phayao Province, and Thoeng District in Chiang Rai Province, is located. Apart from the perfect natural condition, the national park is also a habitat of Pu Lu or Siamese big-headed turtles, a rare and endangered species of turtle. This kind of turtle is small, short, has a long tail and big head. As their head is large, their 4-legs and tail cannot be drawn back into their shell. When their enemies or danger approach, especially forest fire, the turtles are usually killed by the fire. Therefore, Pu Lu turtles have become a symbol of the prevention of forest fire in Thailand. The Pu Lu turtles stay in the abundant forests on the high mountains, near the waterfalls or creeks with clean and clear water flowing throughout the year. The turtles can be observed during the nighttime, while they are searching for food. Namtok Phu Sang is a 25-metre-high limestone waterfall with a stream throughout the year. The water in this waterfall is 33?C warm and clear without the smell of sulphate. Its basin is suitable for bathing. The waterfall is located by the road, 300 metres from the Office of the National Park. On its opposite side is located a welfare shop where visitors can take a rest and have a meal. Phu Sang Warm Spring is a seepage whose water is a headspring of the Phu Sang Waterfall with a temperature of 35?C. It is situated upstream of the Phu Sang Waterfall. The surroundings are abundant evergreen forest and freshwater swamp forest. Tham Pha Daeng is a large-size limestone cave with a depth of approximately 450 metres. Within the cave are beautiful stalactites and stalagmites. It is located 48 kilometres from the Office of the National Park. A ranger leading a visit to the cave is a must. Please inform the national park in advance for a visit. Tham Nam Lot is a small stone cave located at the foot of Doi Pha Daeng, approximately 10 metres from Tham Pha Daeng. The cave is 250 metres deep with a stream flowing through the cave. The level of the water is 50-100 centimetres deep. Visitors have to wade through the water during their cave visit and a ranger leading the visit is necessary. Doi Pha Dam is a limestone mountain where stands a large cliff, a beautiful sculptural art of the nature. It is 1,096 metres above sea level. Doi Pha Dam overlooks the Phu Sang National Park’s Ranger Station 1 (Pha Daeng) within the compound of Rom Yen Sub-district, Chiang Kham District, Phayao Province. It is 47 kilometres from the Office of the National Park. It takes 3-4 hours for a walking tour and a ranger leading the tour is necessary. Tham Luang is a large limestone cave. It is quite wide but not deep, with a width of approximately 200 metres. It is a location of the Ranger Station 2, Huai Sa. Tham Luang is 500 metres from the station and 32 kilometres from the Office of the National Park. Visitors have to slightly climb up the mountains to the cave and a ranger leading the trip is obligatory. Tham Nam Dang is a large cave where there is a waterfall and beautiful stalagtites and stalagmites located inside. It was once a secret refuge of the Pho Ko Kho – the Communist Insurgents. The Nature Study Route There are overall 3 routes in the national park with a distance of 1,400 metres (Huai Miang Route), 1,700 metres (Phu Sang Waterfall Route), and 2,400 metres (Huai Sa Route). Each of them takes approximately 2 hours for a trekking tour. There are also interpretation signs along the route; therefore, visitors can take a walk by themselves. Pu Lu or Siamese Big-headed Turtles are a rare and endangered species of turtle whose origin is in the Upper North and along the frontier connecting to Myanmar, and the southern part of China. Their unique characteristics are shortness, with dark green to black shell, with a length of approximately 15-20 centimetres. The distinctive point is that their tail is lined up in segments and longer than their shell. Therefore, they are not able to draw their head, legs, and tail into their shell. They are very good at climbing by using their nails and tail. Pu Lu turtles search for food during the night. They eat shrimp, shells, crabs, and fish, but not vegetables. During daytime, they usually hide in between the gaps of cold stones. Moreover, in winter, they will hibernate. The National Park provides accommodation, camping areas, as well as, a welfare shop for tourists. For further information, please contact the Phu Sang National Park, Mu 10, Phu Sang Sub-district, Phu Sang Minor District, Phayao Province 56110, Tel. 0 5440 1099. To get there: The National Park is located 90 kilometres from Phayao Province. Take the Phayao – Dok Khamtai – Chun – Chiang Kham – Thoeng Route, 6 kilometres from Chiang Kham District. Turn right into Highway No. 1093 for 17 kilometres from Chiang Kham. Prior to Phu Sang Witthayakhom School, turn right and pass the Phu Sang Minor District Office. Otherwise, travel from Chiang Rai Province – Thoeng – Chiang Kham route. The total distance is 100 kilometres along Highway No. 1021. By bus: Take the Phayao – Chiang Kham District Bus or Chiang Rai – Chiang Kham District Bus and continue by mini bus, routing Chiang Kham – Ban Huak. The bus will pass the Office of the National Park along Highway No. 1093, a distance of 20 kilometres. Mae Puem National Park covers an area of 222,500 rai in Chiang Rai and Phayao Provinces. Most of the areas are steep mountain ranges, being the origin of the Mae Kaeo and Mae Puem Rivers. It comprises dry evergreen forest, deciduous dipterocarp forest, pine forest, and mixed deciduous forest. Plants found in the park include teak, ironwood - Xylia xylocarpa, Burma paduak, Makha Mong - Afzelia xylocarpa, 2-needled pine, rosewood, Hiang - Dipterocarpus obtusifolius, plants in the Fagaceae family, as well as, more than 40 species of birds and other fauna such as barking deer, wild boars, fishing cats, mouse deer, etc. Moreover, it is a significant place of reserving water; namely, Mae Puem Reservoir with an area of around 5,000 rai. During January – March of every year, a large number of teals usually migrate to the reservoir. Activities provided are paddle boats and a nature study route. For further information, please contact Mae Puem National Park, Ban Pa Tueng, Mae Chai Sub-district, Mae Chai District, Phayao Province, 56130 or Bangkok Office, Tel. 0 2562 0760 or www.dnp.go.th. Wat Tha Fa Tai is at Mu 11, Ban Fa Si Thong, Sa Sub-district, on the Pong – Chiang Muan Route. It was constructed in 1768 by Khru Thammasena and Phothao Saen-atthi, the leaders of the Thai Lue people who immigrated from Xishuangbanna, People’s Republic of China. The ubosot is low and made of bricks and cement. Its 3-tiered roof is covered with “Paen Klet” or the Thai Lue wooden shingles. The main Buddha image was engraved of Burma padauk wood in the subduing Mara posture, with a width at its lap of 117.5 centimetres and a height of 227.5 centimetres. It was taken from Xishuangbanna and enshrined on a rectangular Chukkachi base with redented corners, presenting the Thai Lue style of art. The base was decorated with stucco reliefs of vines with black lacquer applied, as well as, covered with gold sheets and adorned with colourful mirrors. Moreover, there is a sermon pulpit whose characteristic is similar to a mondop or prasat with a square base with 20 redented corners, decorated with stucco reliefs of vines and various kinds of animals such as deer, elephants, horses, and peacocks. The distinctive characteristic is the reflecting floral designs inlaid with colourful mirrors. The wihan is low and reflects the Thai Lue style of art made of bricks and cement. Its 3-tiered roof is covered with wooden shingles. The 1st tier is a hip roof, covering the 4 sides of the wihan, while the 2nd and 3rd tiers are in the Prasat style with gables and eaves on the East and West. Pang Kha Royal Project and Development Centre is situated at Pang Kha Village, Pha Chang Noi Sub-district. The area of the centre comprises mountains and rises with a height of 1,000-1,300 metres above sea level. The demonstration plots are open for tourists to visit and study. The activity provided is a visit to the vegetable, flowering plants and fruit plants demonstration plots. The centre also provides accommodation, tents, and sleeping bags. Please contact Tel. 0 5440 1032 for further information. To get there: The total distance from Chiang Mai Province is 285 kilometres. Take Highway 118 from Chiang Mai, passing Wiang Pa Pao District, Wang Nuea District, and Phayao Province into the Chiang Kham District – Nan Route. Then, turn left at Km. 90 and go straight on along the Ro Pho Cho Road for approximately 5 kilometres to the centre. The total travel time takes around 4? hours. Phu Langka Forest Park is the only viewpoint spot to admire the sea of fog in Phayao Province, especially at the field of Dok Khlongkhleng - Osbeckia stellata Buch.-Ham. ex Ker Gawl. - which is usually in full bloom during July – December. It is located at Pha Chang Noi Sub-district with a height of 1,700 metres above sea level, covering an area of 7,800 rai. The Yao hilltribe call the summit of the mountain “Fin Cha Bo”, meaning an enshrining venue of angels. Its miracle has been told that on full moon days, there will be a white aura at the summit. The top of the mountain is very narrow and can contain less than 10 persons. Most of the area is hill evergreen forest with plenty of large trees, as well as, wild flowers and rare kinds of plants, such as Wightia speciosissima, Colquhounia elegans, Dendrobium heterocarpum, Impatiens mengtzeana, Paris polyphylla Smith, etc. It is a venue for the study of the original ecological system of the hill evergreen forest and the source of rivers along the nature study route where there are more than 100 species of fauna and a splendid sea of fog. Interesting sites in Phu Langka include Phu Langka Summit, Phu Nom Summit, Dok Khlongkhleng – Indian Rhododendron - Field, Namtok Phu Langka, Lan Hin Lan Pi – a million-year stone terrace, Hin Yaeng Fa, Pa Ko Boran, and legendary traces of the Communist Insurgents in the past. The forest park provides accommodation and camping areas for tourists. For further information, contact Tel. 0 5441 5748, 08 9559 3432. Other places of accommodation are the Pang Kha Royal Project, Tel. 0 5440 1023, Phu Langka Resort, Tel. 08 6191 0291, and Phu Langka Villa, Tel. 0 5441 9552. To get there: From Phayao Province, take Highway No. 1021, passing Dok Khamtai District and Chun District until reaching Chiang Kham District. Then, change the route into Highway No. 1148. The total distance from Phayao Province to Phu Langka Forest Park is around 120 kilometres. A 4-wheel-drive vehicle should be used for as transportation. From Chiang Rai Province, take Highway No. 1020, passing Thoeng District until reaching Chiang Kham District. Then, take Highway No. 1148. The total distance is approximately 140 kilometres. From Chiang Kham District, Phu Langka is 47 kilometres away. Take Highway No. 1148 for 20 kilometres until Song Khwae, turn left pass the Pang Kha Royal Project and proceed further for 22 kilometres to Phu Langka Forest Park. A 4-wheel-drive vehicle can be rented up to Phu Langka at the Chiang Kham Song Thaeo Queuing Spot. Contact Tel. 0 5441 5992, 08 1883 9838 for further information. Thai Lue Cultural Centre is located at Wat Yuan. The Thai Lue people are peaceful, diligent, patient, and conservative in their culture and traditions such as costumes, housing style, culinary matters, etc. This centre has been established to display the pieces of arts and culture, especially the colourful and elaborately designed Thai Lue fabrics in various patterns such as Lai Dok Kho Khruea, Lai Dok Kho, Lai Ma and Lai Dok Tang, as well as, to professionally train the Thai Lue people. Wat Phrachao Nang Din is at 45 Mu 7, Wiang Sub-district, 4 kilometres from Mueang District along Highway No. 1148. The main Buddha image of this temple is different from those of other temples because there is no Chukkachi base supporting the image. In fact, local people once constructed the base and were about to take the image to be enshrined on it. However, the image could not be lifted. Therefore, the image has been continuously called “Phrachao Nang Din” – the image seated on the ground. According to legend, this image was cast since the Lord Buddha was still alive. Therefore, the image might be aged more than 2,500 years. Wat Analayo Thipphayaram is situated on Doi Butsarakham, Ban San Pa Muang, Mu 6, San Pa Muang Sub-district, 20 kilometres from the centre of the province in the north along the Highway No. 1 Phayao – Chiang Rai route. At Km. 743, proceed for approximately 7 kilometres and turn left into Highway 1127 - 1193 for 9 kilometres. Within the compound of the temple is enshrined a beautiful Buddha image in the Sukhothai style of art, as well as, other images in various postures such as the reclining, walking, seated and protected by a seven-headed Naga one. They were deliberately cast. 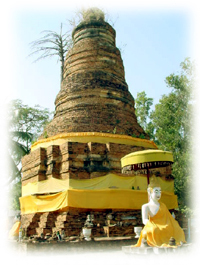 The Rattana Chedi is in the Indian Bodh Gaya style of art. There is also a Chinese pavilion housing Kuan Yin Bodhisattva, a Buddha image hall where a golden replica of the Emerald Buddha image is enshrined, as well as those made of topaz, silver, gold, and gold-silver-copper alloy. From the summit of the mountain, the atmosphere of Kwan Phayao and Mueang Phayao can be clearly admired. There are both steps and a path for vehicles up to the top. Contact Tel. 0 5448 2226. Wat Si Khom Kham is a temple located in the centre of Mueang Phayao by Kwan Phayao. It is a 3rd class royal temple and selected model of a developed one. Local people call it “Wat Phrachao Ton Luang”, after the largest Buddha image in the Chiang Saen style of art in the Lanna Thai Kingdom. It is a Buddha image with a lap width of 14 metres and height of 16 metres, and was cast during 1491-1524. Phrachao Ton Luang or Phrachao Ong Luang is not only a signature Buddha image of Phayao, but also one of the Lanna Thai Kingdom. During Visakha Puja Day of every year, there is a ceremony to pay respect to Phrachao Ton Luang, called “The Ceremony to Pay Respect to Phrachao Ong Luang in the 8th Northern Lunar Month”. Moreover, within the compound of the temple stands an ubosot in the water by the bank of Kwan Phayao, where there are mural paintings in elaborate designs by Achan Angkarn Kalayaanapong, a National Artist of Thailand. Namtok Phu Sang is a scenic waterfall about 20 kilometres to the north of the district town of Chiang Kham on Highway No. 1093. The surroundings are still in perfect natural condition. Phu Sang is different than other waterfalls. It is fed by a hot spring on the mountain which flows into the brook before cascading over the fall.